From Trio to 15 piece full scale band, Rockin' in Rhythm are a versatile jazz/swing band with a varied repertoire. From Trio to 15 piece full scale band, Rockin’ in Rhythm are a versatile jazz/swing band with a varied repertoire. Rockin’ in Rhythm was formed in 1994 and quickly became one of the busiest working bands in the South of England. The band perform for all kinds of occasions and the music works well in almost any setting. Over the years Rockin’ in Rhythm have featured at private functions for businesses and institutions, many of them well known household names such as: IBM, MGM, Credit Suisse, Barclays Bank, American Express, Family Law Bar Association, the Conservative Party, the Labour Party and many others. 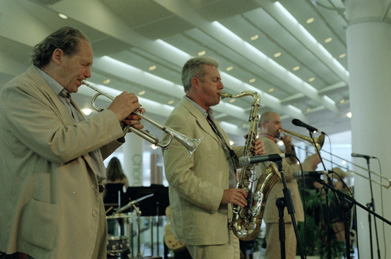 The band regularly perform at events organised by Southwark Social Servies in South London. Rockin’ in Rhythm have performed at various festivals both at home and abroad. These include the Leamington Spa Jazz Festival and a Festival of Music & Culture in Le Havre. They regularly play at the Brighton Jazz Club, St Giles Crypt Jazz Club in Camberwell and the Lewes Jazz Club and have toured in the South of France, Normandy and Sweden. Rockin’ in Rhythm are much in demand particularly in the summer to play at weddings. The music of Rockin’ in Rhythm has a broad enough appeal for both young and old to work very well in this type of situation. Rockin’ in Rhythm are a versatile band and can perform in various line ups from just sax, guitar and vocals trio to a full-scale 15 piece band!